Real-American's Guide to the Mid-Autumn Festival - AiYa! 哎吔! The Mid-Autumn Moon Festival takes place on September 8, 2014 and is much like a Chinese Thanksgiving that celebrates the harvest. 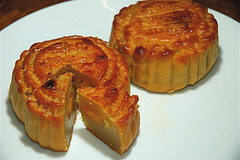 It involves one day (evening actually) where the full harvest moon is enjoyed over fresh fruits and mooncake. Mooncake is a Chinese dessert consisting of a salted dried egg yolk, surrounded by lotus or red bean paste covered with a light, soft cookie crust. The yolk acts as the moon. Ironically, the health conscious have began taking the yolk out to lower cholesterol as mooncake is also one of the few Chinese desserts that is half fat, which is probably responsible for it being so delicious. The Mid-Autumn Festival is also accompanied by a fable. Like most Chinese fables, the story has changed with different times, different emperors, and different provinces. The moral of the story is also varied. Sometimes it teaches humility, other times that love will conquer all, and still other times that rabbits are nice. The end of the story is always the same: a beautiful girl winds up on the moon with a white rabbit, a symbol which adorns every box of mooncakes sold. One thing you can be sure of is that the moon has nothing to do with the woman’s cycle nor a propensity to be moody. One of the original incarnations of the story of how the lady got on the moon with a rabbit, dates back to way before Jesus was born. Here it is translated from the original text based on an eye-witnessed account. 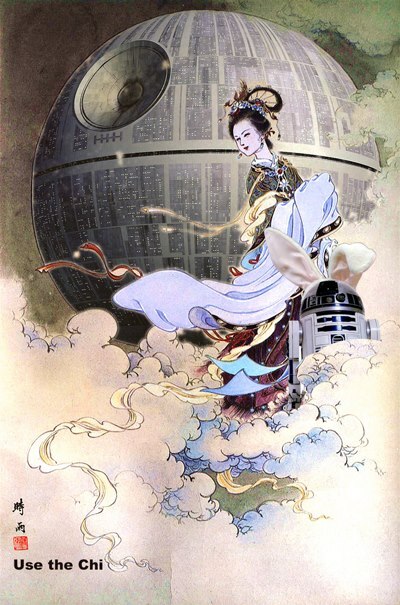 Long long ago, in a country far far away, the young lady princess Chang-O was in the last throes of a rebellion against the evil empire. Chang-O was pursued by the Emperor Pai Pa Tin’s army during a mission to steal the plans for a new empirical headquarters. In a last ditch move, she tied the plans to a white rabbit and set the rabbit free into the forest in hopes that it would reach her lover-slash-rebel leader Captain Hou Yi. Captured by Landlord Dar Fei Dar of the Emperor’s army, and without the rights imbued by the Geneva Convention, Princess Chang-O was tortured but would not reveal any information to the Landlord Dar. The courageous white rabbit reached Captain Hou Yi and delivered the news of Chang-O’s capture and the plans. With this information, Hou Yi was able to gather his rag-tag army, follow the white rabbit, and invade the headquarters in a daring sneak-in. At moonrise, Hou Yi saw Chang-O being held by the Emperor. An excellent archer, Hou Yi shot an arrow directly into the heart of the Landlord Dar stunning him. Hou Yi tried to fire an arrow at the Emperor, but the Emperor was too strong, as he was a student of the dark martial arts and took many immortality pills. He fought back with lightning bolts and strong winds, knocking the Captain and his rebel army down in a bloody, violent massacre. Chang-O, witnessing this horrific sight, struggled to free herself. Luckily the plucky white rabbit hopped to her aid and chewed off her ropes. Once free, Chang-O and the rabbit had a surprise of their own. They had the power of the moon-bright martial arts and with the power of the full moon, battled the Emperor. Amidst lightning strikes and gravity light beams thrashing the countryside, Chang-O and White Rabbit dealt a glorious, final, fatal blow to the Emperor. He fell and perished into a ball of wispy energy. But this great effort drained Chang-O and her rabbit, and as a result, the only way they could stay alive was to take residence on the moon, the source of their great power. And to this day, Chinese children all over the world are safe from the evil Emperor thanks to Chang-O’s sacrifice. The moral of the story is, women can wield great power, but if they use it, they will have nothing else, so they should stay home and make mooncakes for all to enjoy.